Our Thanksgiving trip to Washington, D.C.
We had a great trip to DC this weekend. We were nervous about the driving, but Errol did a great job. I got to add the state of Delaware to my states visited list–pretty exciting. We’re not big fans of toll roads or traffic, but it wasn’t all that bad–just quite a change from I-80. 🙂 On Thursday, we arrived at our hotel in Arlington and walked across the Francis Scott Key bridge to Georgetown. We had a delicious Thanksgiving dinner at Clyde’s, and Thomsen was extremely patient with those of us that try to enjoy our food. 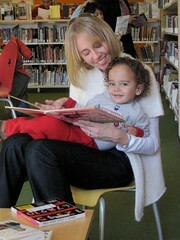 It was a great help that Abby was always willing to read him stories or share her lap. Thanks, gal! 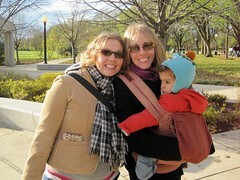 Friday we rode the Metro from Rosslyn to the Smithsonian. Errol was very excited to show the Air and Space Museum to Thomsen. Little boys (and big boys) are always very cute when they’re surrounded by planes. My favorite part of Air and Space was reading about the women behind the Wright Brothers. Susan and Katharine Wright sound like they were pretty fantastic. We had a lovely lunch at Wall Street Deli, and then it was off to the National Gallery. I had heard an NPR story about a photo exhibition there. Robert Bergman’s photographs were very moving, and I always think it’s extra special when you have the opportunity to visit something they mention on All Things Considered. That doesn’t happen too often to this Nebraska girl. We braved the cold wind and dark clouds on a walk to the Washington Monument and the WWII Memorial. Next, we were ready for an early supper and a little Husker football. We ate at the Capitol City Brewing Company near Union Station. It is inside the historic Postal Square Building and had great atmosphere. We were the only Husker fans there and probably the only ones that cared about the game and that was a little awkward, but a win is a win! Saturday was spent in Georgetown. We had tried to go swimming in the morning, but the pool had hardly any water in it! 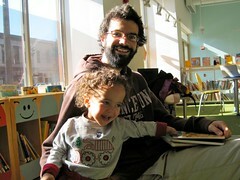 We spent some time at the Georgetown branch of DC Public Libraries. Ab is such a good reader! After a delicious lunch at Pizzeria Paradiso and a quick trip into the North Face store, we were on the road again. After Abby’s drop -off at BWI, Thomsen was quite distraught. He sure loves his auntie and has been asking for her a lot these past few days. Ab, you’re needed to do some stickers immediately. It was an excellent trip and one I hope we can take again. I was so happy because Ab remembered where the bathrooms were at WWII. Thom really had to go!